Germany's under-equipped military, the Bundeswehr, wants to spend hundreds of millions on new weapons. Some of the money will go toward leasing drones from Israel, but first the government needs a new budget. Amidst criticism that the Germany's military hardware is fast becoming obsolete, German Defense Minister Ursula von der Leyen will ask the government for a massive cash injection to update its equipment. According to a list obtained by two German newspapers, von der Leyen is requesting 450 million euros ($553 million) for 18 separate items. A defense ministry spokesman said the Bundeswehr would present its procurement requests to the Bundestag "soon." "We hope that the material situation of the Bundeswehr will be improved," Defense Ministry spokesman Holger Neumann said at the government's Monday press conference. Part of the money is intended for upgrades to Germany's Puma tanks and maintenance of its NH90 helicopters. Money would also go toward a nine-year contract to lease Heron TP drones capable of carrying arms — all in all the cost of this deal will be one billion euros. The coalition agreement signed between the conservatives and the Social Democrats in March sanctions the leasing of the Israeli drones as a stop-gap measure until the development of a European drone within the framework of the European Defense Union. The coalition agreement foresees investments of 10 billion euros to modernize the Bundeswehr, but von der Leyen has said she doesn't think that sum will be sufficient. The latest request for funds will have to be approved by the government when it draws up its budget for 2018. 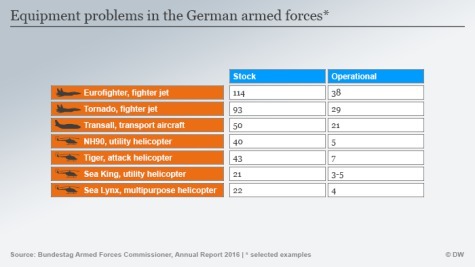 Earlier this year, an internal Bundeswehr document that was leaked to the press questioned whether the German military was well enough equipped to fulfill its duties — a situation termed "scandalous" by members of the opposition. Germany spent around 37 billion euros on defense in 2017 — the ninth highest defense budget in the world. That sum is scheduled to increase to 39 billion euros in 2018. But German military spending falls far short of the 2 percent of national GDP targeted by NATO.